Big Ben to your right, Westminster Abbey up ahead and only 30 minutes left to dance in front of a stranger in front of the London Eye, squeeze into a black cab and make it to Buckingham Palace to pose for an awkward family photo! It’s not every day you get to see the London landmarks, and probably not every day you get to do our wacky challenges (if you do we want to know your secret!) 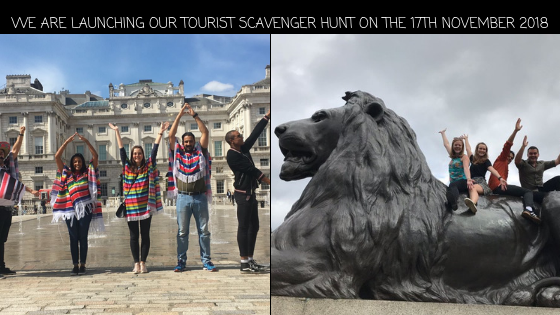 So, we thought it was time to combine the two, creating the ultimate TOURIST SCAVENGER HUNT, when else could you say you did all that in one day? So, let us announce that the Big Smoke Event’s tourist scavenger hunt is launching on SATURDAY 17th NOVEMBER 2018! How exciting! We have created a partnership with the lovely Sohostel* and will be starting and finishing the hunts from there every Saturday from 13:00 – 16:00. It is a brilliant way to see what London has to offer, whilst having a laugh, and racing around to complete all the challenges in 2 hours. And, that’s not even the best part! You can take come along to our tourist hunts even if you are a solo traveller, travelling in a pair or you make up a whole team, you can all get involved. In fact, it is a great way to meet new people, and don’t worry about any awkward silences you’ll be closer than ever after you try and squeeze into the smallest space you can find – quite literally closer than EVER! We would love to see as many people as possible attend the launch on the 17th, it is going to be HUGE! So, whether you are a solo traveller, travelling with a group of friends or perhaps you already live in Britain, but you just want to see the famous sights of London, you are all invited to attend the launch! Free your diary’s grab your trainers and come on down to Sohostel on Saturday 17th November 2018. You won’t regret it, we promise! To book tickets head to Design My Night or contact us and we will be happy to secure a spot for you! We can’t wait to be scavenger hunting with you soon and introducing you to London Town!